Impact employees from all eleven branches gathered on Friday for the All Company Meeting at Muvico in Rosemont. The all-day event began with updates targeted toward Account Managers, including product updates and selling incentives, top performing Account Managers for the quarter, and company financial data. Additionally, sales personnel were informed about the exciting sales incentive trip to Las Vegas for Super Bowl LI. The sales portion of the meeting wrapped up with the annual Boiler Room Contest, in which three reps presented the Impact value proposition. All three participants did the Impact name proud with their presentation skills. In third place was Kamil Bajan, second place was Brad Rozmarynowski, and first place was Brett Meyer. The three competitors were given a $500 credit for 3rd place, a $1000 credit and iPad Pro for 2nd place, and $1,500 credit and vacation for 1st place. Impact provided lunch at the nearby Park Tavern, as the rest of the Impact team gathered to prepare for the company-wide portion of the meeting in the afternoon. 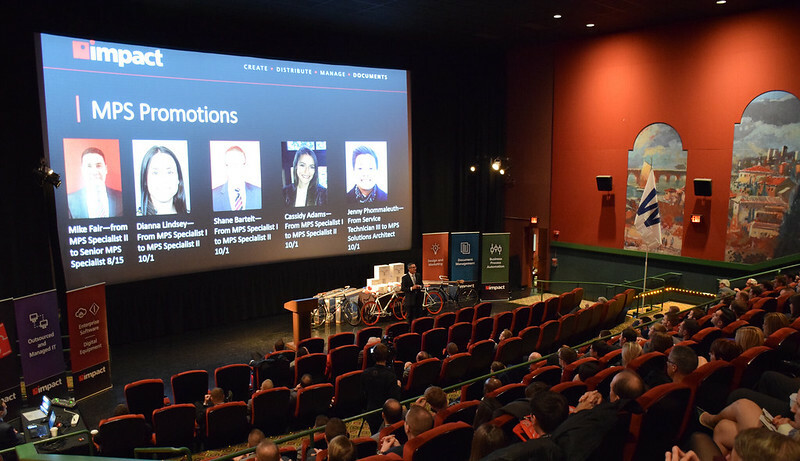 This gave Impact employees from all departments and branches the chance to discuss the growth of the company while hearing from managers and guest speakers. With every employee gathered in one place, the large theatre was almost filled to capacity, a visible symbol of the growth Impact has experienced. One guest speaker, Dr. Tony Alessandro, talked about interacting effectively with various personality types in the workplace, and the other, comedian Steve Rizzo, talked about getting in touch with your “humor being” in order to be inspired throughout the day. President Dan Meyer then offered the Impact State of the Company, the announcement of a new corporate headquarters, and an exciting announcement about five year gifts for Impact employees. Ten-year employees receive the Rolex watch of their choosing, and it was decided that a five-year gift was in store to further recognize employee loyalty. This five-year gift will be a private event at Tiffany & Co. in Oak Park and a $2,000 Tiffany & Co. store credit. After the Impact State of the Company wrapped up, the raffle began, much to the excitement of all in attendance. A whopping 34 prizes were up for grabs for the lucky ticket holders, including eight iPad Pro tablets, six Apple Watches, five 50” Samsung 4K televisions, five drones, six Go Pro cameras, and four Impact branded bicycles. With 280 employees, odds of winning one of these prizes was high, and several Impact employees went home winners. However, even those who did not win the raffle certainly didn’t walk away empty-handed. Every employee was given an Oakley gym bag at the event just for showing up. Alex Zaban won the $500 innovation raffle for his employee time-management initiative.